If Chris Amon is commonly acknowledged as the best driver never to have won a World Championship GP, then surely Jean Behra must be second in that unenviable list of unfulfilled talent. Like the Kiwi, this feisty Frenchman won his fair share of non-championship F1 races - the total commitment to beat the Ferraris at Reims, 2.5-litre engine at his disposal or not, was memorable - but he never lucked into the Championship race victory he so thoroughly deserved. Or rather, they both lucked out of them several times when they had already earned the win. Indeed, in his style and attitude Jean compares very well with his eponymous countryman who over thirty years later had the same talent of signing for the right team at the wrong time - but then Alesi at least won his Grand Prix. On the circuit, both Frenchmen showed a never-say-die approach that culminated in hairy moments caught at the last gasp by phenomenal car control - and in Behra's time, with "driver safety" not even a forethought, this meant putting his life on the line on many occasions. With no money source of mention available to them both Behra and Alesi reached the top through their display of skill and talent alone. Behra moved up through motor-cycle racing, sharing his two-wheel and four-wheel commitments until 1952 before a quick rise through rally and sports cars saw him eclipse Maurice Trintignant as Gordini's Grand Prix team leader. Both had temperament to share, too. Jean Alesi's Sicilian blood was ever present during the 201 Grands Prix he contested whereas the ultra-competitive Behra, an ex-biker brought up in the motor racing hard school, was once described as "combatif, audacieux, brave en course plein de panache, il est aussi impulsif." Which pretty much sums up Jean Behra. Of is there still a need to translate that? 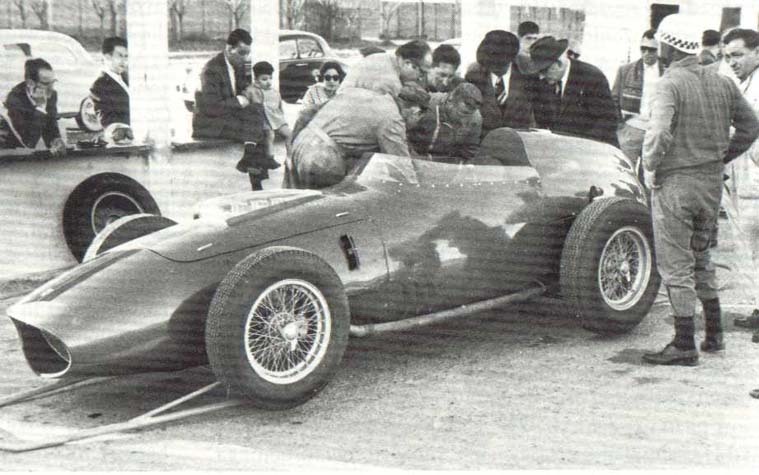 Here we see 'Jeannot' waiting for his drive at the Modena Autodrome: the new Fantuzzi-bodied F1 Dino. Besides Behra, the two people in hats are Ing. Amorotti and Cav. Luigi Bazzi. On the left, leaning on the counter, is team manager Romolo Tavoni, the man that would play center stage in the tragedy that was to become Behra's premature death. Why? Because this is where the comparison with Alesi stops. Although as a Ferrarista Jean Alesi was never known for censuring his own feelings towards the team or the car, his soft and friendly demeanour made his outspoken nature more tolerable, and himself even more loved with the fans. Jean Behra, though, would have his fists flying when something - or someone - upset him, offended him or, indeed, beat him. Maurice Trintignant and Georges Monneret were once at the receiving end of Behra's pugilistic outbursts, and so was Tavoni. It was to be his own undoing. Having survived broken arms and ribs, burns to his face and battle-scarred body, losing an ear during the 1955 TT and tumbling down a ravine during the 1952 Carrera Panamericana, he wouldn't survive his contretemps with Ferrari's top brass. Coming from a works drive at Maserati, which saw him take non-championship wins at Pau, Bordeaux and Bari in 1955, sharing a team leader position with Musso, he was deferred to number two by subsequently Moss and Fangio. His only wins in 1956 would be in Maserati sportscars while a huge smash at the Easter Monday Goodwood meeting caused him to lose his edge for much of the 1957 season. Having received a one-off offer from BRM to drive their P25 at Caen, he immediately gave the British marque its first-ever outright victory in a continental Grand Prix. He was signed on and won the International Trophy at the end of the year. His hopes up, Jean decided to stay with BRM for 1958 but the season proved to be a bitter disappointment. Finally having shown some signs of improvement during 1957 BRM were back to their old self in 1958, slipping down the order again. Several times Behra plainly gave up. Not that there was something explicitly wrong with the car - it was just that it didn't push him as far up the road as he wanted to. As he thought befitted his talent. So at Spa and the Nürburgring he abandoned that wretched BRM just because it made him look bad. And what really got to him was that Schell beat him on occasion, such as at Zandvoort, where Harry finished second with Jean taking third. At Maserati he had always been quicker than Schell. Jean's sportscar season made up for it, for with Porsche he won the French and German sportscar championships and co-drove with Stirling Moss to finished a superb third to harry the Ferraris at Buenos Aires. He also finished third at Le Mans, sharing an RSK with Hans Herrmann. Then came the vacancy at Ferrari, allowing Jean to fill the void left by Hawthorn's retirement. He teamed up with Tony Brooks, another in the category of 'Most underrated Grand Prix drivers of all time', expecting taking the battle to Stirling Moss. Indeed, at Syracuse he finished second to Moss before going on to take the Aintree 200 ahead of Brooks. At the Monaco GP Moss would again be Ferrari's major source of pain. For Monaco Ferrari abandoned the slim bodies that had been tested at Modena and replaced them with short-nosed cars with an air intake that looked like a gaping mouth. This not only gave better cooling but Ferrari also guessed that the slim noses were a likely casualty in the first run to Gasometer. In Championship terms, Moss wasn't the only Cooper driver giving trouble. The two new rear-engined works Coopers were outclassing the front-engined Ferraris with strides, and if that wasn't enough - at Zandvoort, where Behra picked up his first points of the season through a lonely 5th, the BRM P25 he had cursed into the ground in 1958 finally came good. It was only on circuits where power mattered over handling that the Dino V6 gave the Ferraris a performance edge. And at Reims, with its endless straights, the place where the French fell in love with their 'Jeannot', this would be the case. On his home ground Behra looked odds-on for a long-awaited first Championship win. The thing was, Brooks was plainly faster than him. All weekend. Behra was livid. As he himself could not be part of the problem, he sought to blame Ferrari. Not only were they providing Brooks and Hill with better equipment, they were delibately moving to have Jean embarrass himself in front of his fans. Whereas Brooks and Hill strode towards an unchallenged Ferrari one-two, Behra came to blows with Tavoni and had his fists do the talking again before a teary-eyed Jean had to be pulled away from the scene by his wife. On the basis of Tavoni's race report to Ferrari, the Commendatore moved to strike Jean from his driving squad. Behra was fired. His strong self-image had backfired against him. And while the accusation of being a quitter would probably have touched a raw nerve, certainly with the Behra of 1952-'53, he did abandon a healthy car at least three times in 1958-'59. In hindsight the arrival and the subsequent outperformance by first Moss then Fangio at Maserati had probably hurt more than he would ever have acknowledged. Out of a job Behra fell back on his Porsche-based F2 special built by Valerio Colotti. With this car he placed 12th in the Trophée d'Auvergne at Clermont-Ferrand, and second in the two-hour sportscar race, driving his own RSK, before he travelled to Berlin for the German GP at AVUS. He had entered his Behra-Porsche for the Grand Prix itself and would race his RSK in Saturday's sportscar support race. Out to prove himself to the onlooking Ferrari staff he entered the daunting Nordkurve and its 45-degree banking too high, and trying to tighten his line on the damp bricks, lost adhesion. The RSK spun and clipped the rim, in the process hitting an old concrete bunker still there from the war. The Porsche was reduced to bits and pieces, with Behra thrown out into a flag pole. On impact his back and neck snapped. He was probably dead before his body hit the ground.